As soon as I saw THIS stunning card by Nichol Magouirk, I HAD to get my distress inks out and play. Isn't her card the most gorgeous card ever??? I used many elements from her card in mine: a script stamp background, lots of pearls for the flower centres, and plenty of distress inks. Thanks for the amazing inspiration Nichol. I thought I'd give some instructions on how I made the card - I don't normally do this, but just felt like it today. Stamp the main image, one of the cling stamps from the Two Vine Scrolls cling set, in Shabby Shutters and Faded Jeans distress inks, then cut it out. Stamp the Old French Writing text in Shabby Shutters ink. Distress the edges and ink over with Tumbled Glass. Stamp a sentiment from the Just Find Me set. Stamp the script onto a strip of Eggshell Layering Paper in Antique Linen ink then stick the panel to it. That's it - have a lovely day. Simply stunning Lucy, love your take on Nichol's card, just so beautiful. Beautiful Lucy, love your colours and the shape of your card. Great take on Nichols!! 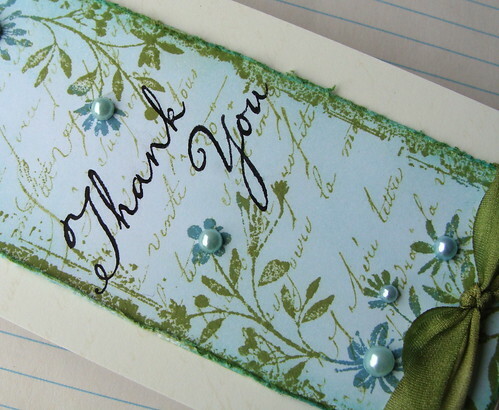 Love the long shape of the card - more to see of your lovely distressing and stamping. Beautiful card and thank you for the "Howtodoit". GORGEOUS card, you make me want to go out and buy all of these stamps! And the card you took your inspiration from was totally amazing too! Lucy, just fabulous, love it. LOVE IT! This may just be my favorite card of yours... ever!!! WOW! Gorgeousness! This is definitely my new favorite Lucy card! 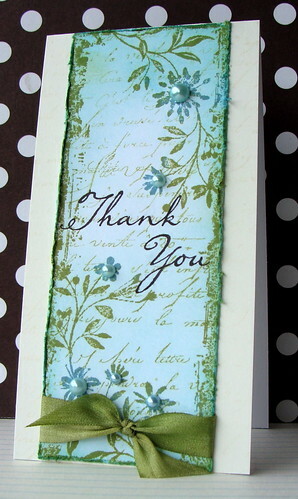 What a lovely card--it does remind me of Nichol's--you both are SO talented, I love your colors and stamping. Your card is beautiful! I just love the tall card - so pretty! Wonderful! So soothing and beautifully done, such softness all around on this card! AWESOME!!!! love it Lucy and yes Nicol's was so lovely. Thanks for the instructions. Perfect!!! Oh My Gosh !! This card is gorgeous, I am off to search for these stamps, just have to have them!! Thanks for all your great inspiration. wow! this is gorgeous, Lucy! beautiful colors and stunning simple design!! LOVE it! I will go to see Nichole's card in a second. But for now I find yours absolutely perfect! Lucy, this card is GORGEOUS. Love how Nichol's inspired you. Just fantastic.